What child doesn't wear a big, big smile when they hear these words, "Come on, let's go to the candy store!" We had three candy stores in Medicine Hat, that I remember, Doty's Candy Store, Houlden's Candy and Ice Cream Store, and Court Brothers' English Sweet Shop, all quality places. these shops were located in advantaged areas, Doty's on a very busy corner of Third Street and Sixth Avenue, Houlden's located on Fifth Aenue and Aberdeen Street, one block from the main swimming pool, a very good spot, and Court's Sweet Shop was in the business section of Second Street. This shop was a wonderland of special candy. Near Court's Sweet Shop - the closest I could get to a relevant photo. 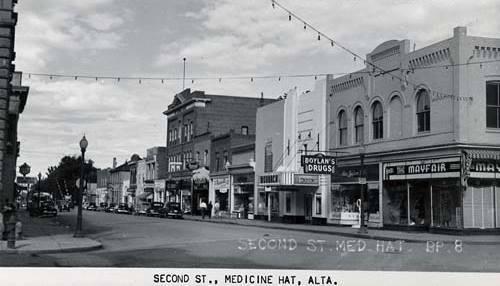 In other parts of The Hat there were also stores on The Flats, The Hill, and Riverside and Crescent Heights, all had theirs. Taylors owned the nice store near my Godmother's on Balmoral Street, we went there when visiting Aunt Mary and Uncle Will. Now I avoid candy, but the yearning is always there, such is life. Wonderful lot of memories. Grampa Evans, Ron's Dad, had a sweet shop in England, he only sold chocolates there. Ring a bell, kids?